Earlier this week, Cameron Newton made headlines when he made comments that the criticism he's received as a quarterback haven't been about race. He also went on to say that we're beyond racism in the United States, much to the ire of many of his black fans. But once again, his theory has been disputed—this time, courtesy of LeBron James' recent praise of Olympic athletes Simone Biles and Simone Manuel. 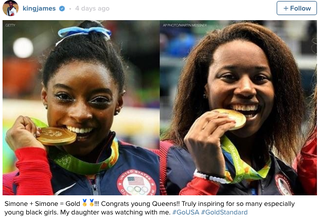 It was a simple post praising the Simones for their gold medals, and he also mentioned his own black daughter. But it seems that certain people felt he should be praising everyone, not just black athletes. It's crazy how white people have the audacity to ask, "Why are things all about race?" when they're the ones who made things all about race from the get-go. So now black people can't praise other black people for their success? But I'm sure if James had posted a photo of a white athlete and said he'd love for his daughter to emulate her, his critics wouldn't have had a problem.